2004 Audrey et Christian Binner Crémant d'Alsace Extra Brut, $28, Jenny & François Selections. I'm a big fan of the wines from this Alsace estate. They are pure expressions of Alsace grape varieties and Alsace terroir. And more importantly, they are absolutely delicious. I tasted through Binner's wines at the recent Jenny & François portfolio tasting and my favorite wine in the current lineup is the Gewurtztraminer. 2005 is the current vintage, and it sings out with fresh flowers and bitter herbs. Like all the wines, it is fresh and pure, and eminently drinkable. Why am I telling you all this, if this post is supposed to be about Binner's Crémant d'Alsace? I guess I wanted to make it clear how great I think this producer is, and how special their still wines are before telling you that I am not crazy about their Crémant. I've tried it before at one tasting or another and never loved it, but the other day at the tasting it impressed me. So I purchased a bottle on my way home to drink with the BrooklynLady. Tastings are a great way to learn about wine, but for me the only way to discover my own truth about a wine is to drink it at home, slowly, with a meal. Not a novel concept, but I'm telling you anyway. Non-dosé Champagne is highly fashionable in the Champagne region right now, but few people really do it right. The problem is that in order to make good non-dosé Champagne, you have to work exceptionally well in the vineyards, to achieve fruit that is ripe enough and complete enough to stand on its own. You can't just take your regular brut NV and decide that you won't add any sugar to it. The Binners without question work exceptionally well in the vineyards - they craft gorgeous still wines year after year. And reasonably priced wines too, by the way. But the 2004 Binner Crémant lacks resonance and depth, and it feels a bit stunted. I gave it the old "how does the wine taste after you leave it out all night" test, and it didn't do so well. I think that it would benefit from a few grams of sugar in the dosage, as un-hip as that may sound. Or maybe it is a lesser selection of grapes used to make the Crémant, who knows. Or maybe this is great wine and I don't know what I'm talking about. Anyone had this wine and care to share their opinion? I am hosting a tasting this Sunday afternoon, March 1st, at Lelabar in the West Village. For $60 you get to drink 6 excellent Loire Valley red wines and enjoy 6 food pairings from the Lelabar menu. From 4pm-6pm, and space is limited. There have already been several reservations (you have to reserve your spot using a credit card), so reserve now before it's too late. C'mon out, it will be fun! In October I went to the Domaine Select Wine Estates Grand Portfolio Tasting. Although I wasn't thrilled with the bulk of what was on display, I enjoyed tasting some great wines that were new to me. Champagne by Leclaire-Gaspard and Bruno Gobillard...excellent. J. Hofstätter's delicious wines from Alto Adige...excellent. The full lineup of Movia wines...excellent (and I witnessed a surreal moment at that table too). But the wine that most impressed me, the wine that I was most intent on finding and drinking at home was a wine from the hills of Avignon in St. Remy de Provence. I had never heard of this town or of this producer, and I don't usually love Grenache wines, so imagine my surprise when the 2004 Domaine Henri Milan Clos Milan simply stopped me in my tracks. Light in color and completely translucent, yet there are potent floral and mineral aromas - it is a deep perfume with a core of rugged elegance, like those photos in Gourmet Magazine of peasants who are really models enjoying picnics on a country hillside. The flavors are clean and pure, with rich herb-infused dark fruit and a meaty presence that belies its feathery light texture. I loved this wine! And it had plenty of acidity and structure to age well. I went back for two more tastes before talking to the guy behind the table and reading the pamphlet to get a sense of what I was drinking (I try to taste "blind" at these events so as to remain as unbiased as possible). Here's what I learned, some of which you can read here. Milan's estate is farmed using biodynamic practices. This wine is 80% old vines Grenache and 20% Syrah from gravel and yellow sandstone soils that Milan is fond of comparing to that of Château Rayas. I looked around and searched the interweb and no one in my area seems to sell this wine, or any other Henri Milan wine. And maybe that's okay, because at about $55, the Clos Milan is pretty expensive for a Provence wine. So I let the matter drop. But last week I participated in a Wine and Spirits tasting of wines from the South of France. I like these wines very much, especially when they are not overly extracted, when they retain some lightness and energy. There are some great values in this part of the wine world. And I think that Bandol is quietly one of the finest sources for big meaty red wines in the world, but that's another conversation altogether. So we tasted through 3 flights of white wines, 2 flights of rosé, and 8 flights of red wines, 35 wines in all. Some nonsense in there, but I was truly impressed with some of the wines. There was one white in particular that I loved, a slightly oxidized wine that rang out with oranges and flowers and rocky minerals. Some at the table disliked it, this was a polarizing wine. But it was without question my favorite white wine of the tasting. And lo and behold, it turned out to be the 2007 Domaine Henri Milan Baux de Provence Les Grand Blanc (about $30). Coincidence? I think not. One of my favorite red wines had pretty berry fruit that was so clean and layered so gracefully on a bed of earthy soil. It was a contrast of delicate fruit and taut structure. And this wine turned out to be the 2005 Domaine Henri Milan Baux de Provence Saint Remy de Provence red blend (about $25). Another coincidence? I sincerely doubt it, my good friend. It's funny though, I wasn't as crazy about the 2004 Clos Milan this time. I liked it, but there were raisiny flavors that I thought detracted from the freshness. No matter, Henri Milan is clearly making wines that I quite like. And I'd still love to drink a mature bottle of Clos Milan in the comfort of my own home with a bowl of herty lamb stew. And then I read that Henri Milan is part of the Nicolas Joly Return to Terroir group that held a tasting this week in New York. More coincidence? I keep trying to forget, but Henri Milan comes at me from all directions. So let me ask you this, readers and wine lovers: who is this Henri Milan? Why do his wines appear on none of your blogs, in none of your retail shops, and why have I never heard you talk about him? Am I the only one who likes these wines? What's going on here? C'mon...speak up. François Ecot opening a bottle of the delicious Plageoles Sparkling Mauzac. Pierre Jancou, owner of Racines wine bar in Paris, his wife Celine to his right, and mystery woman to his left who may very well be Olivier Cousin's wife Claire. Alsace vigneron Christian Binner, with red plate halo courtesy of Burgundian vigneron and merry prankster Dominique Derain. Jenny Lefcourt and vigneron Olivier Cousin. Wine writer Pamela Govinda and De Vino owner Gabrio Tosti. And the hostess herself, the luminous Alice Feiring. NV Moutard Père & Fils Brut Brut Rosé Cuvaison, $34, Polaner Selections. Some of the best values in Champagne are coming out of the Côte des Bar in the Aube, the southern most region that's closer to north-east Chablis than it is to Reims. With some exceptions, these tend to be red grape dominant wines. The whole area was until somewhat recently summarily dismissed and the grapes and/or juice sold to the négoce houses. More and more growers in the Aube now bottle their own wine, often times with fantastic results. Perhaps the biggest star currently is Cedric Bouchard, and although his wines are a value in the sense that they are phenomenal wines, they are not cheap. 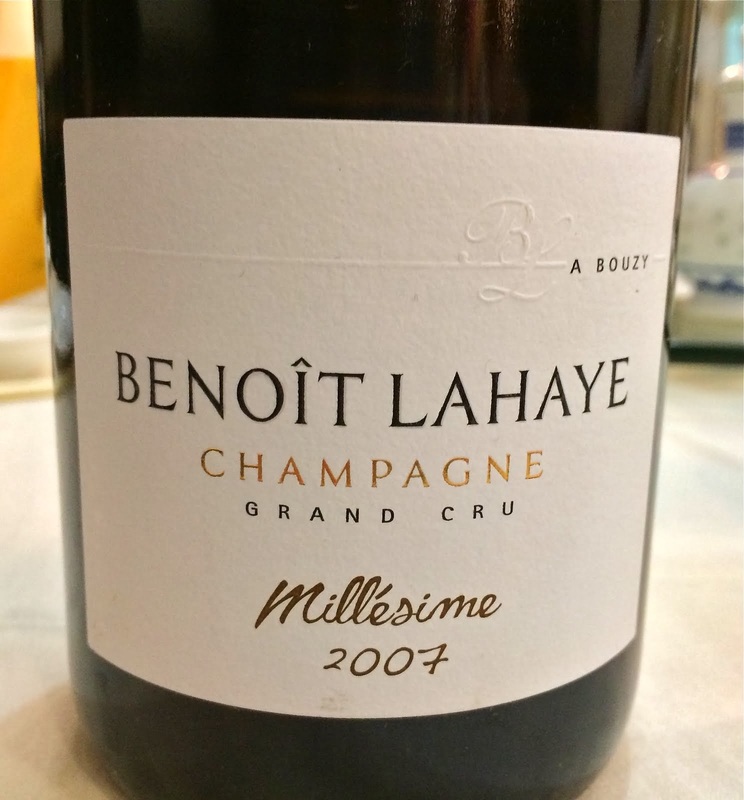 Some producers, however, are making wines that are priced at the low end of the grower Champagne spectrum, and I've been pleasantly surprised at how great they can be. One of them, Pierre Brigandat, was featured here a few weeks ago. Another leader in the area is Moutard. Moutard is technically a négoce in that at least 5% of the grapes used to make their wines are purchased from other growers. I don't know exactly how much they purchase, but I don't believe it's much more than that. Moutard makes a superb non-vintage Brut that retails for no more than $35, less than that if you're in the right store. They also make two highly unusual wines that feature the three "other" Champagne grapes: Arbanne, Pinot Blanc, and Petit Meslier. Check out Peter Liem's post for more on these. There are two rosés, the Prestige which is produced by adding still red wine to the blend, and this wine, the Cuvaison, which is made using the saignée method by which the wine stays in contact with the skins for a period of time before the juice is bled off. Peter tells me that Cuvaison is more of a rosé de macération than a saignée, but he would have to explain the difference to you. I find that I prefer rosés of Champagne that are made using the saignée method. They just feel more alive to me, more vibrant. And this wine is no exception. This wine is truly lovely, such a fantastic value at this price. It has rich mineral-infused fruit aromas, quite vinous and intense. The nose is fresh and pretty, not overly exuberant, more about elegance and finesse. Same on the palate - it is ripe and delicious with mineral and earthy fruit, good acidity and balance, and the finish leaves a gently spicy fruit fragrance. The overall effect is one of poise and restraint, which might be atypical among rosés de saignée, but I think it works perfectly here. This wine is an absolute pleasure, one that I would buy again and pour for anyone. And it has a great photo on the cork-top. Although there is no disgorgement date listed, there is a small code that reads "LBR 06 - 05/08." I interpret that to mean it was based on the 2005 vintage, bottled in 2006, and disgorged in May of 2008. But I could be wrong, and it would be great if Polaner and the other importers out there would demand that the producers include this information on their labels. My friend David McDuff is hosting the 54th edition of Wine Blogging Wednesday, the monthly online tasting event created by my pal and New York Wine blogger extraordinaire, Lenn Thompson. I used to participate regularly in WBW - it was one of the reasons that I started blogging. I even hosted once, a little over a year ago. Recently I've kind of dropped the ball. But McDuff has selected Piedmont as his theme, a region that I know essentially nothing about. So of course I will join the fun this month. Actually, I probably drank more Piedmont wine last month than I have previously in my entire life, thanks mostly to my friend Asher, who recently hosted a lovely Piedmont wine dinner. Most of the notes below are about wines I drank at Asher's house. My impression of Piedmont is that it is involved in some sort of battle with itself, an identity crisis, if you will. There are traditionalists and modernists, and there doesn't seem to be a lot of overlap. And I don't mean only in the Nebbiolo land of Barbaresco and Barolo - I'm talking about humble Barberas too. Can they be simple and fresh, easy to enjoy with food, in the same vein as a good cru Beaujolais? Or will they be extracted and "serious," losing their innate character? It seems to me, in my limited experience and knowledge, that the best values in red Piedmont wine come from Barbaresco, the queen to Barolo's king. Fantastic and ageworthy bottles can be had for $35 and under, in the case of the superb Produttori del Barbaresco, about $25. But maybe I just haven't had a truly beautiful mature Barolo yet, a bottle that costs about $50 in today's dollars and that just blows me away. Here are notes on Piedmont wines from last month: two Babera's, two Barbarescos, and two Barolos. Thanks to the McDEE for hosting in such a classy fashion, and for selecting a challenging theme. 2005 Giacomo Conterno Barbera d'Alba, about $30. An excellent wine, the best example of Barbera that I've ever had. Reminded me of a great Beaujolais in the way there is energy, density of fruit, and mineral soil, and yet a fresh brightness, a light almost weightlessness in the mouth. So drinkable, and complex with soil and minerals. Fantastic. And I challenge you to name a meal that this wine would not compliment. Basically, an impossible task. 2006 Paitin di Pasquero-Elia Barbera d'Alba Serra Boella, about $17. The only wine of the lot that I had at my house, all the other's were at Asher's dinner. Dense and dark on the nose and the acidity is a bit volatile. No tannic grip, not a lot of structure, and that makes this tough to drink, like an untamed beast. It falls off at the finish and feels a bit hot from the alcohol. I'm not excited, and half the bottle goes into the fridge. Day two - far better, although still doesn't hold a candle to Conterno's Barbera. Then again, this is half the price. Still dark and dense, but the fruit is more expressive and there is a pleasant herbal character now. The acid is still intense, and this is much better with cheese and cured meats than it is on its own. Also, much better at cellar temp than at room temperature. I wonder...is there carbonic maceration here, in part? So similar to Beaujolais in some ways. 1996 Paitin di Pasquero-Elia Barbaresco Sori Paitin, about $40. Clearly excellent quality, but not as compelling to me as the 2004. I don't know if it's the characteristics of the vintage or if the wine was made in a different style, but this was much darker and more intense than the 04. The fruit had a raisiny character that for me made the wine lack freshness, brightness. And the acidity was a bit flat too. Maybe it's in an awkward phase and needed more time in the decanter. This will definitely appeal right now to folks who like a richer and more concentrated style. 2004 Paitin di Pasquero-Elia Barbaresco Sori Paitin, about $36. Roses, earth, tar, some tea. Just a gorgeous nose. Flavors follow through on the palate and the finish has a nice herbal component. Fine grainy tannins provide ample structure, great acidity provides excellent balance, even at 14% alcohol. This wine has great energy and presence. It is absolutely clean and pure, and its aromas and flavors are perfectly defined. It's completely delicious today, although I would love to drink it in 10 years. Aside from a superb bottle of 1961 Vallana Spanna Podere Tre Torre di Traversagna I had in August, this is the most compelling bottle of Piedmont wine that I've had. 1997 Marcarini Barolo La Serra, about $50. This one quite literally jumped from the glass - really. Huge and powerful aromas of cherry fruit carried onto the palate and throughout the finish. I appreciated the big fruit character of this wine, but right now it's not showing a whole lot of complexity, and in the end, it didn't hold my interest. What happens to this wine in 10 years? Are there secondary characteristics hiding underneath all of that fruit, or is this a one-note wonder? 2000 Marziano Abbona Barolo Pressenda, about $45. Lots of wood on the nose and on the palate partially obscures the pretty fresh fruit, which has nice herbal undertones and an interesting medicinal edge. The tannins are drying on the finish. I wish they had taken a more balanced approach to the wood on this wine, as the underlying material seems rather lovely. Although the feeling in the air is definitely one of restraint, BrooklynLady and I managed to enjoy quite a feast together on Valentine's day. She knows that I have a thing for pudding - any kind, any shape, any flavor - I love pudding. So she made this fantastic mushroom bread pudding using Cremini, Chanterelle, and Oyster mushrooms, shallots, and other goodies. So savory and so delicious. But my wife, I am lucky to say, really loves me, and she didn't stop at one pudding. This was a night of two puddings. BrooklynLady made butterscotch pudding for dessert. And I must say, it was fantastic. I love butterscotch but I've never had home made butterscotch pudding before. I would wear an IV and have a constant butterscotch pudding drip, if it were legal in New York State. BrooklynLady loves to go to the various Chinatowns but it's hard to do these days with a 6 week old and a 2 year old and competing nap schedules. So I made what I will call Chinese style braised oxtails, using a blend of dark soy, rice wine, and water as the liquid base. I added sliced ginger root, crushed garlic, about a quarter of a cinnamon stick, crushed star-anise, and several lengths of orange peel to the braising liquid. I like to cook the braising liquid down to a syrupy glaze after the oxtails are meltingly tender. Strictly speaking, these delicacies might not go together, if you were trying to create a harmonious and balanced dinner. But like the reality of love and partnership, we each bring something to the table and do our best to appreciate the other, to create something harmonious out of sometimes dissonant parts. And it turned out to be a great meal. Tell you what - I managed to knock it out of the park with the wine pairing. I was (selfishly) thinking about the oxtails, and what wine might work well with them. I remembered the distinct hoisin, Chinese spice aromas that I get on the wines of Chambolle-Musigny. Now I have only a few bottles of wine from that village, and they are in off-site storage. Things that are too young to open now. But I remembered reading somewhere that Lignier-Michelot's Bourgogne is made from grapes in Les Bon Bâtons, a plot in Chambolle. Why not give that wine a try? The 2005 Lignier-Michelot Bourgogne, $23, Becky Wasserman Selections, is a wine I've enjoyed several times over the past couple years, and this was easily the finest bottle yet. It didn't show pronounced hoisin notes the way wines such as Mugnier's or Roumier's Amoureuses did, but it was delicious nonetheless. The nose is rich with dark plums, black tea, and earthy minerals. The palate is well balanced with intense fruit, good acidity, ample structure, and nuanced minerality. The finish is all finesse and class,with lingering gentle spicy fruit flavors. The last glass was the best, and had that core of poignancy that to me signals a wine at it's apex, and I imagine that this wine will be at its absolute best in another year or two. I wish I had more. I hope your Valentine's meals were as eclectic and harmonious as mine. An official from the Motion Picture Association of America (MPA) contacted me recently to inform me that Sunday February 22nd, the date of my guest sommelier spot at Lelabar, happens to conflict with the showing of the 81st Annual Academy Awards. She wanted to know if I would consider changing the date of the Loire Reds tasting. So I spoke with Andrew, the manager of the bar and we decided that everyone wins if we push the date back one week to Sunday March 1st. The other details remain the same: Sunday (now March 1st) from 4-6pm; 6 Loire reds that I select, food pairings to accompany the wines, a lovely setting in the West Village on Hudson Street off Leroy Street, $60 price tag. This is a good deal - you're drinking several glasses of wine, all told, and eating a modest meal too, in a cute little place in the West Village on a Sunday afternoon for $60. So come out and enjoy yourself, taste some great wines from the Loire, check out a cool wine bar, and support your local Brooklynguy. Two of the wines that will be poured: 2006 Bernard Baudry Chinon Cuvee Domaine and the 2006 Catherine & Pierre Breton Bourgueil les Perrières. Those two alone are worth the price of admission. But wait, there's more! There are four other great wines too. NV Julien Frémont Cidre Pays d'Auge Brut par Nature, $12, Louis/Dressner Selections. The recession has officially hit Brooklynguy's blog folks - it just doesn't feel right to drink a bottle of Champagne every week - I need to be a bit more conservative with the family finances. But there are sparkling wines made all over the world, many of them inexpensive, and some of them interesting and delicious. I'll share them here as I find them. Found one for this week, and it's not even made from grapes. Normandy is France's apple country. Calvados, the potent apple brandy, is the most well known drink to emerge from the region, but the ciders (French spelling - cidre) can be delicious too. They can also be quite sweet and lacking in character, often enough so that I've given up on trying random bottles. But this year the Dressners decided to import Julien Frémont's two cidres, and that makes them anything but random. Frémont farms cows and apples on 45 hectares of land. The drawing on the label depicts the eternal struggle between apple and cow. I don't know the apple varieties used, but I doubt we're talking about Red Delicious and MacIntosh. Dressner's site says "the trees are a mix of old local varieties of acidic, late ripening apples." Frémont makes two cidres - a non-vintage Brut and a single-orchard cidre (yes, you read that right) from particularly old trees. The single-orchard cidre is sweet - the apples undergo passerillage, the process by which the fruit dries out and the sugars concentrate. The cidre we drank, the NV Brut, is absolutely bone-dry, with a round and generous nose of fresh apples. There is a hint of the ocean underneath, BrooklynLady says. The palate is shockingly dry, although it rounds out a bit and shows a sweeter character with a half hour open. See if you can make it last that long. The overall effect is the purest essence of fresh apple, and that's a lovely thing. The texture is super smooth, with the barest spritz of a mousse. This is only 5.5% alcohol, less than half that of most wine, so drink away - open two bottles. We drank ours on its own, but in December Eric Asimov wrote about drinking one of his favorite ciders with dosas, the Southern Indian fermented rice and lentil flour wraps. An inspired combination! Drinking this cider we imagined eating take-out Chinese food, specifically moo-shoo pork. I can think of only a couple sparkling wines at this price point that I think are as good a drink as this cider. It's worth a try, if your shoppe carries the Dressner goods. What about you...do you like the ciders? In my last post about the Governor's proposal to allow grocery stores to sell wine, I didn't discuss New York wine producers. How will they fare if this legislation is enacted? On the whole, NY wineries seem to support the proposal. There are about 21,500 grocery stores in New York State and about 2,500 liquor stores, according to the Rochester Democrat and Chronicle. That means an additional 19,000 potential customers. That's an exponential increase and could mean an explosion in revenues. I don't know though...if I were a NY wine producer, of good wine anyway, I would not be so excited. I might even be a bit worried. There is nothing in the legislation to ensure that grocery stores stock New York wine. In other words, the decision whether or not to purchase New York wine would be at the discretion of the grocery store, as it is at wine and liquor stores. The model of sales at a grocery store is quite different from that at a wine and liquor store. Grocery stores do not use sales staff to advise customers. In a grocery store, the product must speak for itself and brand name and price (and location in the store, but that's another story) are of paramount importance. Customers faced with a wall of laundry detergent must make their own decisions about what to purchase. No one says to a clerk "I'm thinking about a detergent and I want it to be a good stain remover, but I don't have a lot to spend. What can you recommend to me?" But that is precisely what happens in wine and liquor stores everywhere. Perhaps not so much for sales of Gallo, Yellow Tail, or other mass market wines with good brand recognition. But for wines that cost more than $15 or $20 a bottle, and for small production wines, many customers like to speak with sales staff before making buying decisions. This will not be possible in grocery stores unless the store hires an employee for this purpose. And by the way, the wine stores that can't do this kind of thing well are among the stores that are more likely to go out of business if the legislation is enacted. Without such an employee (and even with one), New York wines are likely to get lost in the supermarket wall of wine. Why? Because New York wine does not yet have the brand recognition to sell itself. And because wines from California and the rest of the world have an established reputation for quality that New York wines do not yet have, but New York wine often costs the same amount or more than their counterparts from elsewhere. The New York wine that sells for under $10 might compete with similarly priced wine at a grocery store. But I would guess that the higher end wine would not sell at a grocery store. Imagine a customer with no prior knowledge of New York wines - what must happen for that customer to decide to purchase an $18 or $26 bottle of Long Island Cabernet Franc? Sales staff would have to recommend the wine. Retail sales of high end New York wine might actually decline under the new legislation if the people who buy a $25 bottle of wine every now and then stop shopping and wine and liquor stores and start doing their wine shopping at grocery stores. I received an email today from the marketers who represent the National Federation for Independent Business (NFIB). In their email they included a link to the wine list at a Wegmans (a large Rochester-based grocery chain) restaurant called Tastings. There are 110 wines on the list, four of them are New York wines. The NFIB claims that this is representative of what will happen at all of the large grocery stores under the new legislation. But hey, that's just the way I see it, and what do I know. Wine producers seem thrilled about the proposal and wine and liquor stores are terrified. In fact, I heard from New York wine blogger Lenn Thompson that some retailers are exerting pressure of their own. Lenn told me that he has reliable sources who say that "In upstate New York, any wineries that show public support (for the proposal) are being unofficially boycotted by wine shop owners (meaning that wines are being pulled from shelves). It's getting ugly up there...but no one is talking on the record...which you'd expect." Care to share your opinion? How do you think New York wine producers would fare if this proposal passes? Should NY Grocery Stores Sell Wine? New York, like most every state, is faced with a massive budget gap for fiscal year 2009/10. State spending will be cut, existing taxes will rise in some cases, and there will be new programs for raising revenue. According to the Rochester Democrat and Chronicle, one of the revenue raising proposals put forth by New York Governor David Paterson is legislation that would allow supermarkets and grocery stores to sell wine. The Governor claims this move will raise revenue because grocery stores that choose to sell wine will first be required to pay a "Franchise Fee," a fancy name for a license. It is estimated that under the new law, Franchise Fees would net $100 million for New York State in the next fiscal year. Paterson's office also claims that this move would lead to an increase in wine sales, generating further tax revenue. Should New York State allow wine sales in grocery stores? This is a complicated issue, even without all of the various lobbying nonsense cluttering up the thought process. We don't know the details of what he is proposing, but we love the idea. This is something we have been encouraging for decades now because we feel it would be a great service to the consumer. Local wine shops and their lobbyists also seem to be willing to say anything to advance their argument. They like to threaten moral chaos, claiming that grocery stores could not reliably prevent minors from purchasing wine. Grocery stores already sell beer, and I assume that the typical minor would opt for beer over wine as the illegal alcoholic beverage of choice. And these are the same local wine and liquor stores that "unknowingly" sell booze to minors and knowingly sell booze to people whose rampant alcoholism forces their entire body to shake as they fork over $2.69 for a half-pint of Rotgut Vodka. Now, though, they are concerned about morals. Maybe the best bit of nonsense is the actual revenue predictions themselves. Why would wine sales go up 20% if wine were sold in grocery stores? That argument assumes that demand for wine will be created as a result of this legislation, and the market already seems to show that wine sales are down. Perhaps grocery stores would see an increase in wine sales (where they currently have zero sales), but that surely would be balanced by a decrease in sales at local wine and liquor shops. Perhaps the Governor means that grocery stores would lower wine prices, thereby stimulating demand for wine, and resulting in a net increase in wine sales. Unless grocers can get discounts by buying in bulk from distributors, lower prices are unlikely. And even if they do get discounts, the Governor has quietly proposed an increase in the excise tax on wine from .18 cents to .51 cents per gallon. So before you get excited about paying $9 instead of $10 for Gallo Chardonnay, understand that you'll pay $9.33. 1. The Governor needs to create revenue, and this is one way of doing so. 2. Wine and liquor store owners feel threatened by this proposal, as they fear it would take wine sales away, ultimately forcing them out of business. 3. Grocery stores love the proposal because it would allow them to open up a new and profitable business. I think that the local wine and liquor shop owners have a legitimate argument. Local shops would lose sales to grocery stores, mostly in the low price, high volume, low profit margin wine category. There are people who entered the market as a wine shop owner with the understanding that they would not have to compete with large grocery stores. It's not fair to pull the rug out from under them now. But I also think that separating the sale of food and wine is an artificial conceit. Why should a grocery store be allowed to sell chips, dip, and beer, but not wine or Gin? Why should a wine and liquor store be allowed to sell wine and Scotch, but not beer, cheese, or cured meats? Why should government ever enact laws that protect one type of business from healthy competition with other businesses? Well, there are times when protectionism might make sense, but American consumers are happier when those protections come in the form of tariffs against foreign producers of, say, steel, so that our own steel industry is advantaged. It's easy to understand why our government would try to protect American industries. Why would we favor one set of our businesses over another? If New York decides to change the rules regarding wine sales, they should do so in a manner that removes all of the artificial barriers that currently govern grocery stores and small wine shops. Allow grocery stores to sell beer, wine, food, and spirits. Allow wine and liquor shops to sell beer, wine, food, beer, and spirits. If we're going to open the market, then let's really open it. Local wine and liquor shops might have trouble competing with grocery stores under a truly open system, the way mom and pop coffee shops have trouble competing with Starbucks. But maybe that's not a bad thing. In fact, I think it is this competition that will in the end benefit consumers. The only good thing in my mind about Starbucks is that it forces independent shops to compete, to provide better coffee, better bathrooms, innovative programs such as music recitals or other entertainment. Mom and pop coffee shops cannot compete with Starbucks on the cup of coffee alone. In the end, consumers have higher quality coffee shops to choose from. Perhaps if Governor Paterson's legislation passes, the same thing would happen with wine shops in New York. There certainly are a lot of terrible wine shops offering crumby and poorly stored products sold by ignorant and/or indifferent sales staff. Under a truly open system, some of these stores would improve their products and service, others would not and would eventually close. I think it's time to stop asking for artificial protections, time for everyone to step up their game. What do you think? I don't usually write about a wine for Friday Night Bubbles if I drink it at restaurants or at friends' houses. I can't be as attentive to the nuances of aroma or flavor that way, I can't track the wine's progress over the course of the evening the same way I can in my own house. And I like to be able to photograph the Champs myself - it's just something I've grown accustomed to. This week is an exception, as I had a wine at a restaurant recently that really moved me. I have no photos to share, and I didn't make notes at the restaurant so my tasting notes will be of a general nature, but there is something worth sharing here. My in-laws were in town for my daughter's 2nd birthday, and we went to dinner at one of my favorite local places, Rosewater. We celebrated with a very fine bottle of Champagne, the 1996 Pierre Gimonnet Blanc de Blancs Cuvée Gastronome. The 2002 vintage of this wine was featured just a few weeks ago in another Friday Night Bubbles post, by the way. And while we very much enjoyed the 2002, the 1996 is an entirely different animal. A more formidable animal. Maybe an animal that might hunt and eat the 2002, should it be hungry. Cuvée Gastronome is a low pressure Champagne, at 4 bars instead of the typical 6. The idea here is for the wine to get along more easily with food - less mousse to interfere, or something like that. I don't think I agree, thusfar, that this makes the wines more food friendly. Quite the opposite, actually. Of the low pressure Champagne I've drank, including a couple of vintages of Cuvée Gastronome, Cedric Bouchard's wines, and a Doyard wine, all of them seem to me best consumed alone, as food would so easily overwhelm their delicacy. But that's just me, maybe you've experienced something entirely different, and do share. 1996 is one of those super-vintages, one that carries with it very high expectation. But there are questions as to whether or not the some of the wines will be balanced, as they are so high in acidity. This wine was, to me, a great example of what a 1996 should be - a perfect amalgam of delicacy and grace, with richness and power. The nose is immediately more mature, as would be expected, and it offers several layers. There are lower register rich notes of toffee that blend seamlessly with upper register notes of bright citrus fruit, the whole of the thing encased in a delicate mineral shell. Really a beautiful nose, and by the end of the 30-45 minutes I spent with this wine all of the parts were in perfect harmony. And I have no doubt that it wasn't finished unwinding at that point - this wine clearly has more to reveal. On the palate it was a delicate blend of roast nuts and ultra-clean fruit, with a strong vein of acidity to ground everything. This is a wine that defies the temptation to list flavors and aromas because ultimately it was in perfect harmony and nothing stood out. It was just simply beautiful wine. I would love to drink it again in 5 years to see how it evolves. I need to put more Champagne in the cellar. One night a few weeks ago I forgot to put our leftover baguette in a plastic bag, and the next day discovered how delicious it is to make my own breadcrumbs. Literally, it is as easy as this: break the stale bread apart into chunks and plop them in the blender or food processor. I'll never buy breadcrumbs again, these are so much tastier. And stale bread has now become something to look forward to. I've used my own breadcrumbs several times now, once to make meatballs, but mostly to make my 2 year old daughter one of her favorite things to eat - breaded and fried chicken thighs. The other night I decided that it was time to use homemade breadcrumbs to make dinner for BrooklynLady. I swapped a couple of Flying Pigs Farm pork cutlets for the chicken thighs. Pounded them tender and thin between two pieces of wax paper and put them in a mixture of milk and egg to soak. I seasoned the breadcrumbs with salt and pepper, grated Pecorino and Parmesan cheeses, and a large three-fingered pinch of dried oregano. I went with broccoli rabe as a side dish. This very healthy bitter green smells and tastes much better if you very quickly submerge it in a pot of boiling water before cooking it. I then cooked it in good olive oil, coarsely chopped garlic, dried red chili flakes, and a splash of Nuoc Mam (Vietnamese Fish Sauce). I used to use anchovy fillets and melt them slowly into the hot olive oil, but I couldn't ever get them to fully melt, and this tastes just as good. What to drink with this meal? Many wines would work, but what I thought of was a young Barbaresco, like the 2004 Produttori del Barbaresco, or even better, the 2004 Paitin Barbaresco Sori Paitin that I had at a friend's house the other night and can't stop thinking about. Sadly, we were in possession of neither of those wines. Actually I do have a stash of the Produttori, but it's in offsite storage. So what else would work? I was about to open my last 2002 Domaine du Closel Savennières because I love that wine and I think it goes with basically any food. But in the end I decided to save that bottle, and arrived at what turned out to be a perfect pairing, as it always is...Beaujolais. 2006 Domaine Diochon Moulin-à-Vent Vieilles Vignes, $22, Kermit Lynch Imports. I thought I'd entirely missed out on this wine in 2006, but I found two stores in Brooklyn recently that carry it - Fermented Grapes on Vanderbilt Avenue, and Windsor Wine Shop on Prospect Park West. It's drinking beautifully right now, such a beautiful Beaujolais. Freshness and purity on the nose, showing raspberry coulis, herbs, and iron magnet-minerals. The palate still has some grip - this wine will most definitely improve with 3-5 in the cellar, but it is smooth and approachable now, and entirely delicious with ripe fruit and snappy acidity. I'll make a concerted effort to hold onto my remaining two bottles for a few years to let them develop, but I really cannot promise anything. Want to know something funny? I was poking around some of my oldest posts the other day and I found something almost exactly like this one, only with store bought breadcrumbs and a far lesser Beaujolais. Things change, and stay exactly the same. So I guess you should check back in two years - maybe by then I will have some sort of new insights into pork cutlets and Beaujolais. 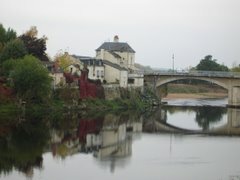 The northern most vineyards in western France are in the Loire Valley appellations of Jasnières and Coteaux du Loir. The Chenin Blancs from these places have never been as sought after as those from Vouvray, Montlouis, or Savennières. Probably because this is a difficult region to grow wine grapes - it's cold and ripeness does not come easily. And there hasn't exactly been a plethora of inspired grower/producers either. 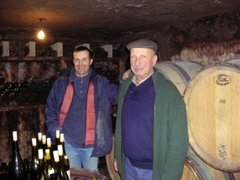 In the late 1990's inspired wine making came to Jasnières and Coteaux du Loir in the form of Eric and Christine Nicolas who own and operate Domaine de Bellivière. They are firmly in the healthy farming/natural winemaking camp. When they replant they use sélection massale or cuttings from old vines (as opposed to using clones), they plow all of their vineyard surface to aerate and to remove weeds (as opposed to spraying with herbicides), they harvest entirely by hand, and fermentation is achieved via naturally occurring yeasts. They have been fully organic since 2005 and as of 2008 farm their entire estate biodynamically. All of this is meaningless, though, if the wines don't taste good. Well, they taste very good, sometimes great. There are sweet wines made in vintages that promote botrytisized grapes, but the workhorses of the Domaine in the white wine department are the four dry to off-dry Chenin Blancs, two from Coteaux du Loir and two from Jasnières. The Coteaux du Loir wines are L'Effraie (The Owl) from younger vines, and Vieilles Vignes Éparses (Scattered Old Vines) from vines of between 50-80 years old, scattered among several different plots. The Jasnières wines are Les Rosiers from younger vines and Caligramme, another old vines cuvée. Of Bellivière's wines, the Jasnières are more accessible, more typical in their Chenin Blanc character, and more expensive. The single finest Bellivière wine I've had is the 2006 Rosiers (haven't tasted the other 06's yet though). I guess you might say that the Jasnières wines are "better." But in general I prefer Bellivière's Coteaux du Loir wines because of their unique terroir stamp. L'Effraie and Vieille Vignes Éparses both show classic Chenin Blanc characteristics - aromas and flavors that include wool, wax, quince and other orchard fruit, herbs, honey, and minerals. But they show something else too, something that I have experienced in no other wine: distinct aromas of what I would call fir tree and wintergreen. Even in a hot and ripe vintage like 2005 when the wines were richer and sweeter than usual, these trademark aromas were still evident amidst all of the fruit. 2004 Domaine de Bellivière Coteaux du Loir L'Effraie, $22. An incredibly strange wine, but I love it. This is all about fir trees and herbs - wintergreen, mint, bay leaves. The palate is fresh, not oxidized, and still kind of grippy. This has a long life ahead of it and I wish I had more. It reminds me of Oregon's Clear Creek Douglass Fir Eau de Vie. 2005 Domaine de Bellivière Vieille Vignes Éparses, $18 (because Chambers Street has it on closeout for some reason - it should be closer to $30). Like the 2004, this wine is bursting with fir notes. As per the vintage, this wine is fuller and thicker than the 2004, and I don't think that's a good thing in this case - the lithe intensity of the '04 made more sense to me. Decent acidity, a smoky herbal finish, this paired beautifully with my friend Adam's roast pork shoulder stuffed with lemon rind and capers. 2005 Domaine de Bellivière Jasnières Les Rosiers, $18 (again, closeout at Chambers Street). This has a lot of residual sugar and not enough acidity to elevate the wine. It is good, but not memorable. I preferred 2004 of this wine, and prefer the Coteaux du Loir wines in 2005. 2006 Domaine de Bellivière Jasnières Les Rosiers, not yet released. A much more complete wine than the 2005, this one shows its beautiful honeyed fruit but also a thick layer of minerals. It is on day 3 when the wine really begins to open up, showing broad and expansive flavors of classic Chenin wool, lime, and gorgeous delicate bitter honey. Super fresh and with good acidity, this is delicious wine that will age gracefully. Bellivière's wines are imported by Louis/Dressner Selections.